This Core SWX Hypercore Slim Gold Mount Battery Kit with D-Tap Charger is a B&H kit assembled to provide you a powerful professional battery and D-Tap charger. 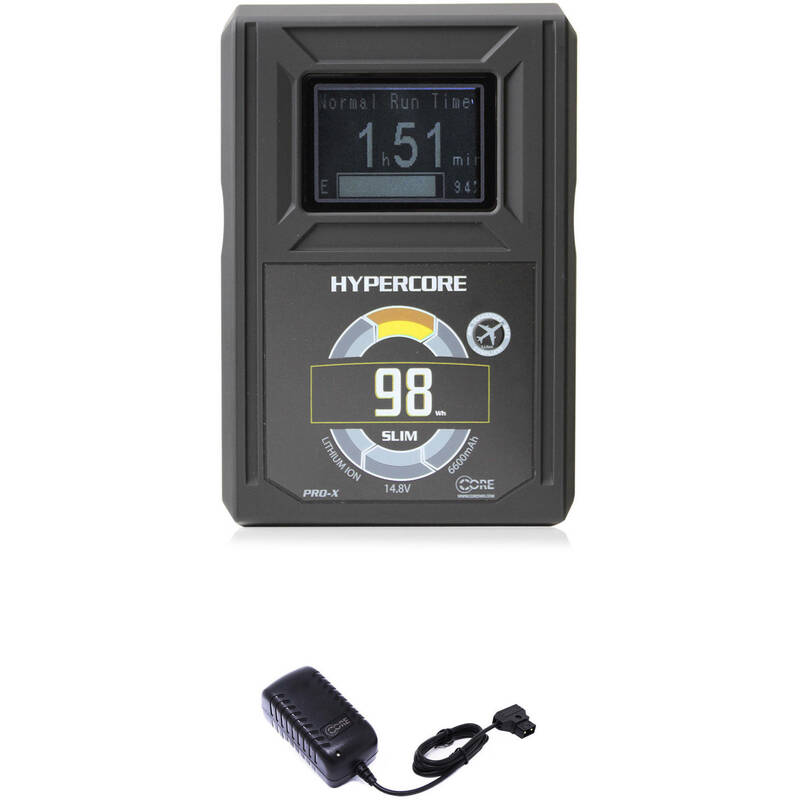 The Hypercore Slim provides 98Wh capacity in a low-profile design, which makes it well suited for use on gimbals. It supports 12-amp continuous draw, making it capable of handling power-hungry cinema cameras, lights, and accessories. This Gold mount model is compatible with Anton Bauer equipment, and will charge on Anton Bauer chargers. The Core SWX Hypercore Slim Gold Mount Battery is a professional battery designed for modern production workflows involving a wide range of equipment. The slim design means the battery takes up less horizontal space than previous-generation models to better fit gimbal stabilizers and other rigs where space is at a premium. Though the design is less space-consuming, the Hypercore Slim provides the same 98Wh capacity as its predecessors. For power-hungry cinema cameras and lights, the 12-amp maximum continuous draw will keep your equipment powered. This Gold mount model is compatible with Anton Bauer equipment, and will charge on Anton Bauer chargers. In addition to the Gold mount power output, the Hypercore Slim features D-Tap and USB outputs. The D-Tap output can be used to power a light source, a monitor, recorder, or other part of your rig while you can connect your smartphone or other USB accessory for convenient charging. A 25-watt load on this battery will last approximately 3.5 hours. The LCD battery status display screen on the rear of the battery is backlit with a cool white illumination, and updates every few seconds to accurately reflect up-to-the-moment statistics, including runtime. The battery itself is housed in Core SWX's classic over molded casing with a rubberized finish that is resistant to impact and is easily grippable. Box Dimensions (LxWxH) 8.0 x 7.0 x 3.0"